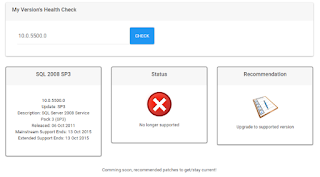 Introducing my latest SQL Server Life Cycle and Versions lookup tool. Back in 2016 I released the first version of this app and the goals were the same. 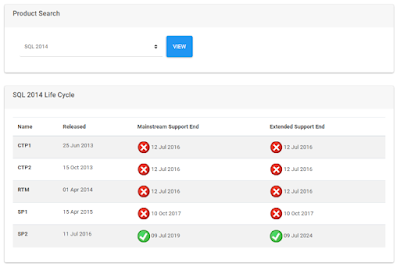 Provide an interface to easily lookup a SQL version number and find out the support status of that released. 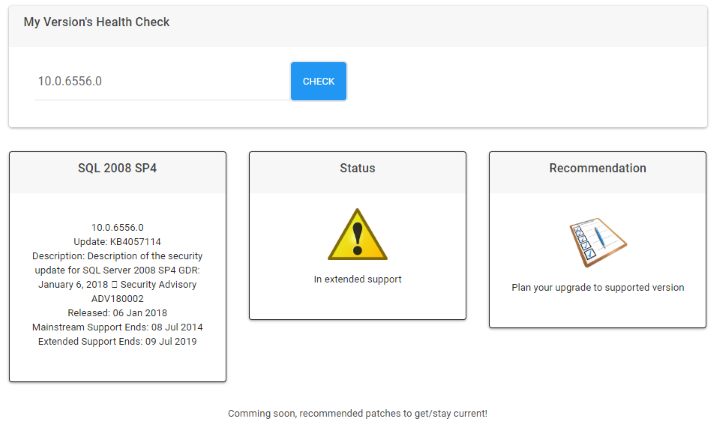 All backed with an API that could be queried from scripts and other tools. This new release is a complete re-write and includes a modern responsive site written in Angular (because I felt the need to learn). 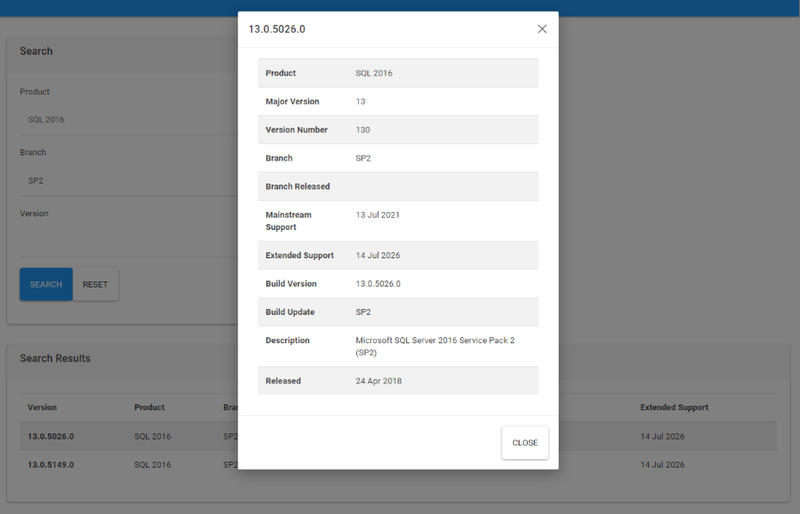 The search feature allows you to lookup a specific release of SQL Server or version number and then see all the releases that match that search result. 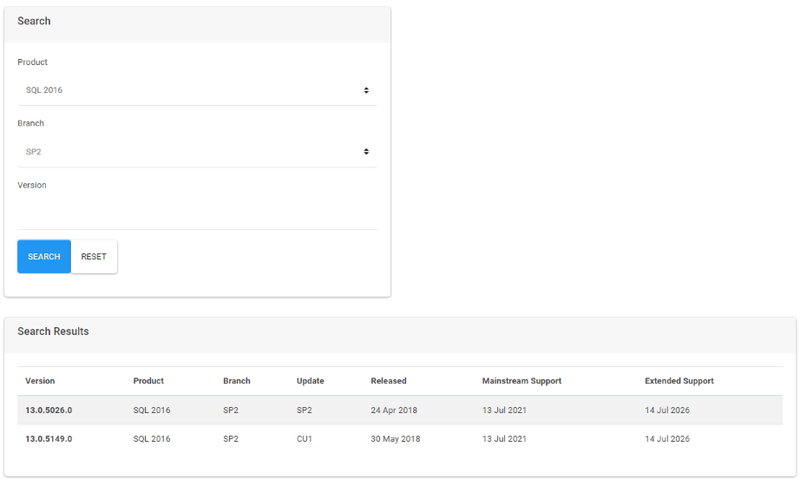 In the results you can see the release date, mainstream and extended support dates. 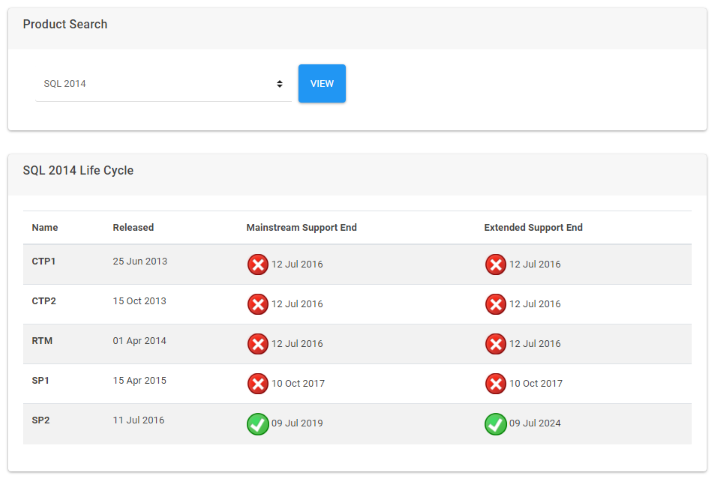 The life cycle search page is just a page to quickly lookup when certain branches of a product release will end mainstream support or extended support. This was created as while onsite consulting I sometimes need the ability to quickly look up life cycle information rather than a specific version. It was also a "wish list feature" from a customer I was working with at the time. 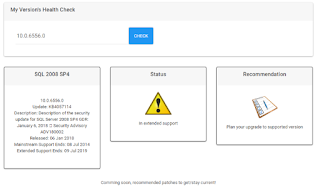 The health check is a beta release of my end goal which is to allow you to enter your version number and get basic recommendations about how to upgrade. 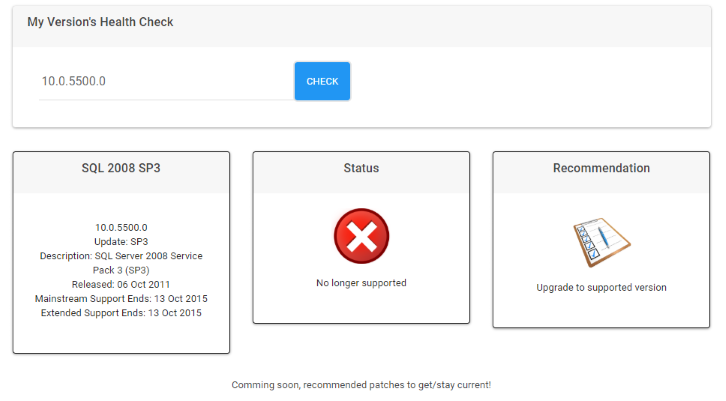 The initial release simply recommends to either start planning to upgrade or to urgently upgrade depending on that versions support status. 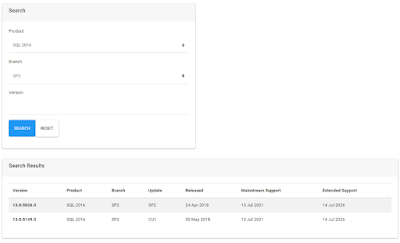 My vision for this feature is to provide guidance about updates that have been released on the same branch to stay current and also life cycling plans for upgrades to service packs or next release. One of my main goals with this app was to ensure that it had an API which could be queried and then used to extend other tools and scripts. 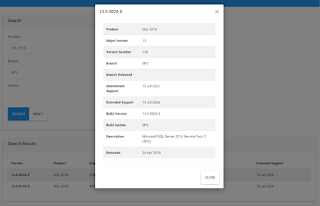 For example you could incorporate it into a Health Check Script to retrieve the version number from the SQL Instance and then call the API to get information about the life cycle and support of that release. Or you could use Power BI taking data from your CMDB and performing a lookup against the API for the rows or a search against the API and store that as a query with a relationship link. Soon, I will update the samples repository I provided for the previous version to reflect the new API syntax. Lastly a note on the data. There is no dynamic link from this data to any Microsoft or other site. The data is provided "as-is" and manually maintained by myself and a few trusted peers. We do our best to make sure it is up to date and accurate but for any business critical or commercial decision make sure you refer to the official sources. If you like this tool, or have some ideas for improvements, or even notice inaccuracies in the data please let me know. Timefactors har stort følgende og med rette. billig rolex klokker De har flotte, holdbare mekaniske bevegelser og vil tjene i mange år. Comprar Hublot Fake Clock, Best Breitling,repliki zegarków Breitlingbreitling replica, italo fontana underwater, repliki cartier, zegarki hublot replica, fałszywe zegarki breitling, replica montblanc, come buy heretanie ZegarkiRolex fałszywe zegarki, oglądać breitling repliki, repliki zegarków marki heuer, omega oglądać kopię, rolex fałszywe omega tańsze.